Cambridge is full of old buildings and against many of them, there is a wisteria planted that has had many, many years to grow. There are some pretty large ones that cover whole sides of buildings. They all pale in comparison to the monster wisteria that grows in the grounds of Anglesey Abbey. This one isn’t against a building; instead, it uses a row of six tall deciduous poplar trees as its support. It was originally planted at the base of a garden wall. 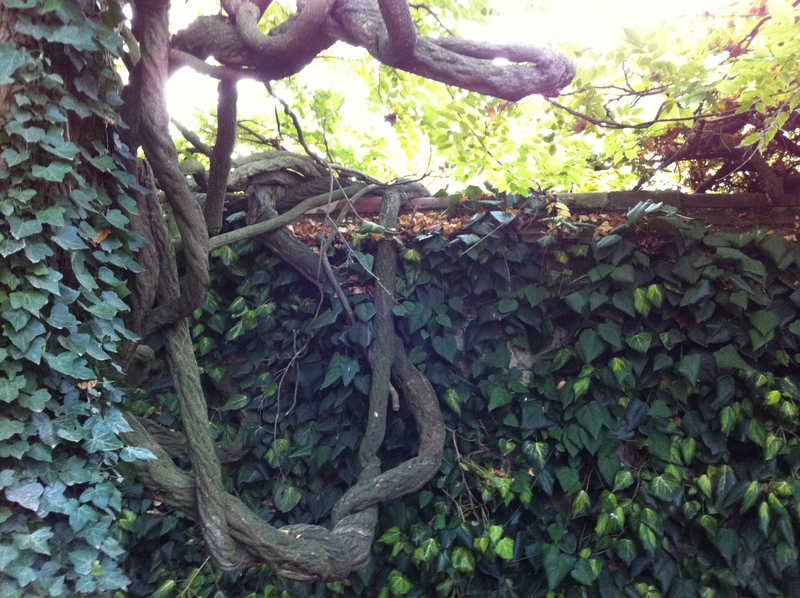 As the wisteria grew, it scrambled up the wall and flopped over the other side. The photo is the back of this wall and you can see the main trunk coming over and running up the ivy-covered tree trunk in the left foreground. The poplar trees are in a row behind the wall and the wisteria must have somehow caught a low branch on one of the trees and then off it went up into the sky. 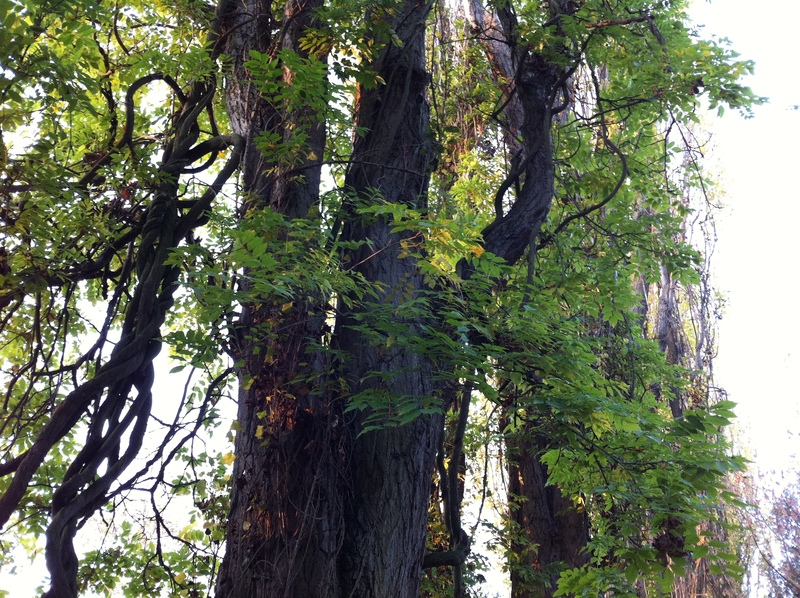 As the trees are planted fairly close together, it wasn’t much of a leap for the wisteria to spread from tree to tree. 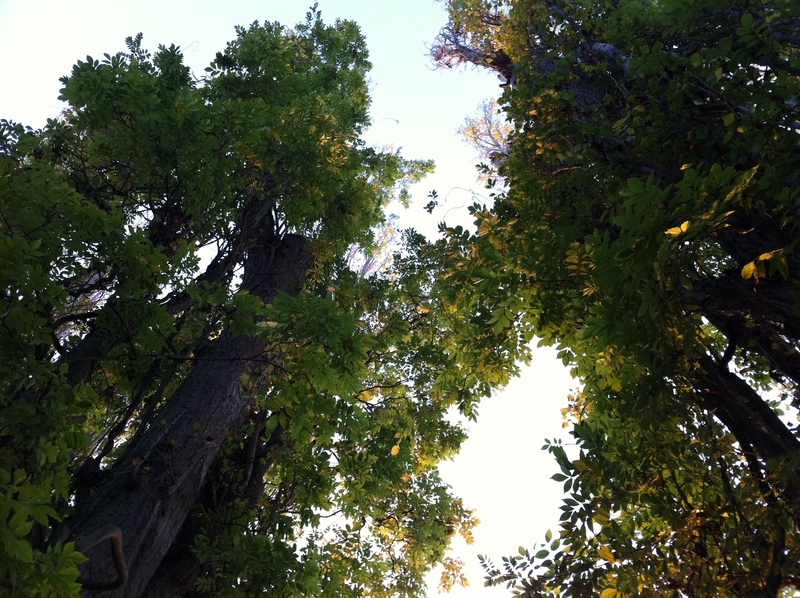 All the green foliage in the photo is from the wisteria and it goes right to the top, all along the row of trees. It truly is an enormous plant, certainly the biggest climber I have seen. It makes the young one we have running along the house look like a seedling. I will definitely be returning in the spring to see this in flower.